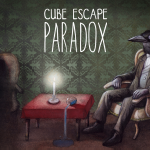 Cube Escape: Paradox is Coming September 20th! And very soon on Steam! Where will you be able to watch the movie? Great game, strange atmosphere, delightful music, nice and stylish graphics, non-standard tasks and mysterious mystical storyline! Sincere gratitude to all those involved! dope! CE is the best best game ever.